I was babysitting my friend’s children last March. 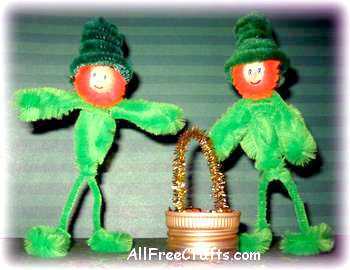 I had some chenille stems, so I helped them make two cheerful little leprechaun figures for classroom dioramas. I think that these wee Irish folk would also be amusing hidden around the house or posed on a table for St. Patrick’s Day. Take one bumpy chenille stem and fold it in half so that you have two bumps that line up on each half. Thread a wooden bead just over the end of the folded top, then twist the two stems together just below the bead. Cut a second bumpy chenille stem in half so that you have two pieces each with two bumps. Set one of these pieces aside. Take the other piece and thread it between the two body stems, placing it just below the spot where you twisted the body stems together just beneath the bead. This piece will form the arms. Push the arm piece up against the bead then twist the two body stems together again just below the centre of the arm piece, catching it tightly between the two twisted spots. Bend each end of the arm piece toward the back to form the two arms and lightly twist the end around to secure. Twist the body stems together where the legs begin. Bend each of the legs at right angles toward the front to begin making the feet. Curl the foot section in a circle and twist the end around the “ankle” section of the leg. Test to see if the leprechaun will stand up. You will probably need to adjust the bend of the foot and to make sure that the circle of the foot sits flat on your work surface. If the figure is still off balance, try bending the upper body forward or back a little until it will stand on its feet. Make a simple face by drawing on two blue or black dots for eyes and a shallow “U” shape for the mouth with permanent marker or paint. Cut a small piece of orange chenille stem and curve it into a “U” shape to fit around the bottom of the bead as the leprechaun’s beard. You’ll need room at the top of the bead for the hat placement in the next step, so do not make the sides beard too high. Apply white glue to the back of the beard and press into place with your fingers until the glue holds. Cut a straight green or black chenille stem in half. Set one half aside for other projects. Begin curling the remaining half around a pen or pencil. When you have about three curls, do one more curl, then keep curling over the stem in this one spot until you come to the end. When you remove the stem from the pen, you should have a small hat shape with a brim, similar to those shown in our photos. Press down all the spirals, or pinch them between your fingers, to compress them and close any gaps. If there is a gap at the very top adjust the end to close it. Apply white glue all around the underside of the hat brim and set the hat in place, with the back part of the hat covering the back side of the head and the front of the hat set on top of the beard. Cut a small length of gold chenille stem and bend it into an upside down “U” shape to fit inside a bottle cap. Apply glue to each end of the stem and set it into the bottle cap. Let dry. Fill the bottle cap with plastic gold confetti. Find a small cardboard box with an open top that you can lay on its side to hold the diorama. Cut green paper to fit the inside bottom and glue into place to represent grass. Cut blue paper to fit the inside back, top and sides, to represent the sky. You could also use white paper and draw or paint some trees, mushrooms, a rainbow or other scenery. Apply glue to the bottom of the leprechaun’s feet and hold in place until the leprechaun will remain where you want it. Glue the bottle cap “pot of gold” beside the leprechaun. Glue some gold confetti on the ground around the pot as if it has just spilled out. Apply glue to a small cotton ball and set it inside the pot. Apply glue to the top of the cotton ball and sprinkle it with gold confetti until the cotton ball is completely covered. Let the glue dry. Add other pieces of scenery (fairy mushrooms, shamrocks or clover) as desired. Happy St. Patrick’s Day!